Our meeting will be held April 21, 2010 at the Harrod Park, Harrod, Oh. Time of the meeting will be 6:00 P.M. Bring your metal detector with you if you would like to hunt the park before and after the meeting. I guess the first order of business, is Dues are due. As always they are $10 and are due at the first meeting. With the prices of silver what they are, we may only have one hunt this year, more on that at the first meeting. Please pay your dues, because this money is what we use for the club hunts and it also pays for the building and park that we use. A little bit about our last meeting, all who attended had a great time, good food and everyone won lots of prizes. Our Thanks go out to Jeff Hauenstiein and Colleen Bradley and Colleen’s daughter for a fun evening. For those who missed our meeting at the The Western Sizzler Restaurant, you missed a good one. I have been a little under the weather for awhile and Lila Dickerson has stepped in to help me with our first club news letter. Here is what she wrote about her and Bill’s winter out west. 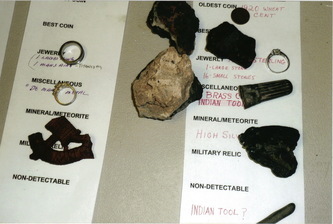 Bill and I spent two months in Tucson, AZ and while there, we looked up two detecting clubs. One was Detectors Unlimited and the other one was Desert Gold Diggers. We both went to the meeting in January of the Detectors Unlimited, and they have about 60 members and around $6,000 in the treasury. Over 30 members were in attendance and I sent some pictures of best finds to Denny in his birthday card. They were going to have a club hunt the following Saturday at Rosemont, this being an old deserted mining town. Everyone who showed up that Saturday received a silver dime. We had our brother-in-law with us and since he's not into silver dimes, he gave me his. He just goes along for the photography. 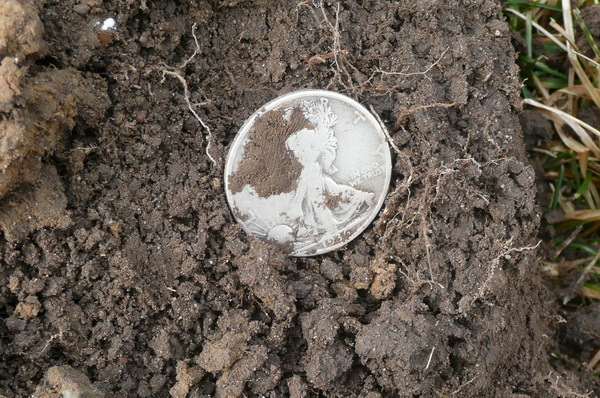 The only old coin found that day was a 1903 dime and it was a beauty. I found a Parade Rodeo ballcap in a wash area and lots and lots of empty gun shells. Bill found an old clock mechanism. Their website is www.detectorsunlimited.org if anyone is interested in looking them up. Bill went to the gold diggers club and they were going to have a hunt the following Saturday but we didn't go. They own some mine claims and only 4x4's are able to get there. Bill said a lot of the members had some big gold nuggets they had found, and even go to the gem show in Tucson where they sell them. This must be the biggest gem show in the world, and there are vendors from every nation you can imagine. It went on from Jan. 30 thru Feb. 13th. The website for this club is www.desert-gold-diggers.com. We also went hunting with 3 of the members of the club at a park. Ed (the retired arson inspector) is a lot like Denny and Harry. He finds a lot of stuff. Bill found a sterling ring with a small stone in it, and .925 was marked on the outside of the band. I found a 1952 Canadian (wheat) penny?!! We brought back a lot of mineral rocks and one GEO. Found that on the way back to the Sibley mansion. It was built in 1908 by Indian labor, 20 rooms, oak floors, picture windows and mirrors, and was abandoned in 1910. By 1912 the roof was off the mansion, and by 1917 it had been completely vandalized. 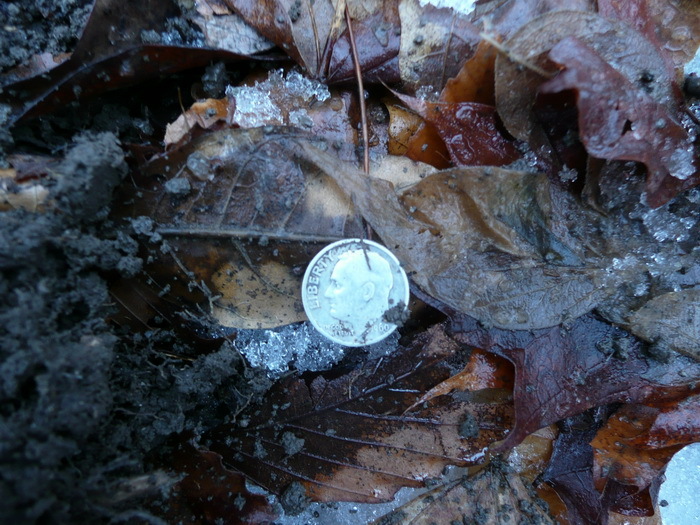 I found a 1999 quarter there. We hiked a total of 6.7 miles that day, and had to cross a mountain stream 40 times to get there and back. I have lots of pictures of the terrain. Also I picked up some fool's gold in the area. Harry Foster has a new detector, an Omega Teknetics. We went metal detecting at Simon's ballfield on April 3 and you guessed it! Harry found a necklace with a sterling ring and diamonds in it. He doesn't even have a pinpointer and he's pulling up coins right and left. He was with us last October out on Grubb Road where the city is building a new reservoir, and I think he found a silver dime and a so-so ring. 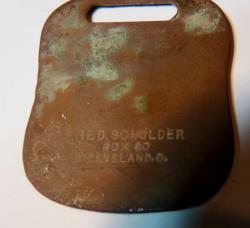 I found a #6 sleigh bell and I'm proud of it. Bill was able to find $100,000 in bearer bonds at North Fairfield, Ohio last November. He was hunting for a lady whose father-in-law had buried them and more goodies in the yard. He had a general location for them, and after a lot of poking under a porch deck, he hit the PVC tube. Yes ladies and gentlemen he was on his stomach crawling around like a dog. They were wet when he opened the pipe up, but she was going to have them restored. Looking through some pans that Marsha was going to throw out, we found some silver dollars, a gold coin, and a few other old coins that was slated for the dumpster. If it hadn't been for the stepmother, Bobbie, they would have been history. Also in Concordia, KS I bought two jars of miscellaneous stuff, a half gallon and 1-qt. I found 3 pressed pennies in them, 3 Mexican coins, 6 clay marbles, 1943 penny, McCollough Oil Co. knife, 1949 Kansas license tag, a token from Shop and Save at Neisner, Beloit, KS, and some Christopher medals, plus more. Then I recycled them to the Thrift Store in Lima. Wow, it sounds like Bill and Lila had a interesting winter out west. Bill found the Money here in Ohio and I think he and Brad are going to go back this spring and look for more. Not sure how much of the things they found they were able to keep, if anything. But it was neat to be able to find that much in bonds and old coins. I think I want to go with Lila and hunt the old antique stores. Sounds like some pretty interesting items in those jars she bought! Thanks Lila for a very interesting article. It was much appreciated. 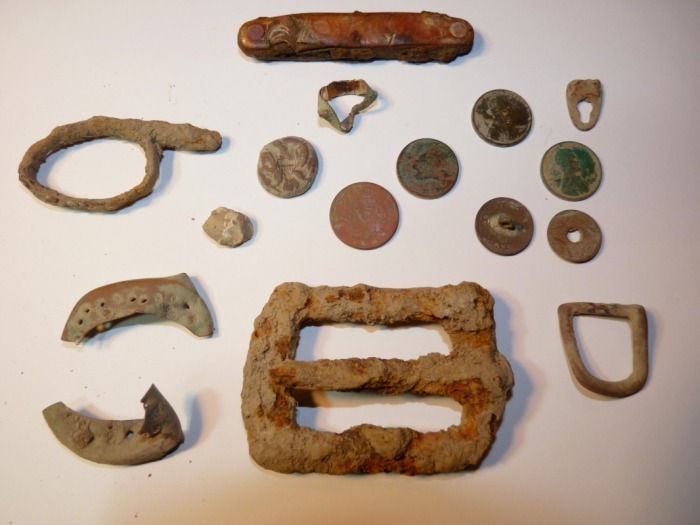 I received this from Anne Stratton this winter, sounds like she is using her ACE 250 and finding some interesting finds. I'm happily residing in Mission, Texas until the 20th of April. In Mississippi couple of weeks ago - I found a 1925 Stone Mountain 1/2 dollar - pretty rough shape - but seeing Robert E Lee and Jackson together thrilled me....think this was issued in honor of Chancellorsville. Jealousy will get you nowhere!!!! Sorry I missed breakfast, but I am here and it is 90 degrees for the past 3 days!! Gary Rutledge and I have detected every month this year. A couple of months we only got out one day, but we detected. LOL I think between the both of us we probably have 10 or 15 silver coins. Gary found a really nice Walking Liberty Half Dollar also. Last week I dug up a Rosary with Saint Christopher and a Cross on it. I think that is a First for me. 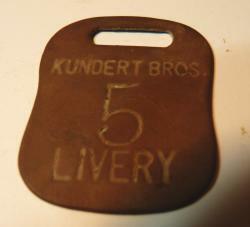 I also dug a really nice Livery Tag, from Delphos Ohio, I found it 20 miles from Delphos at a one room school house site. More on that later. Brad Saunders and I hunted in Virginia at DIV XII. We had a pretty good time. 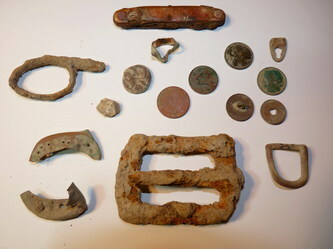 My first day at the hunt which was at Brandy Rock Farm, I found a Script “ I “ Confederate button, in pretty good shape. Another first for me. I had a pretty good hunt as well as Brad, it did rain on our hunt on Sunday, but we were still able to dig some pretty nice relics. Gary Rutledge and I hunted in Virginia this past March at DIV XIV. Brad Saunders was unable to go because of family problems. Before the hunt, Gary and I drove to Virginia a few days early. We visited several Virginia Historical sites, including Chancellorsville, the site where Stone Wall Jackson was mortally wounded, The White Oak Museum, this museum was put together by a father and son who found almost everything in the museum. This is a must see Museum if you ever get to Fredericksburg, Virginia. Our last stop was at the Museum of the Confederacy and the Confereate White house in Richmond, Virginia. We toured all these sites with some friends of ours from Nashville Tenn.
For those interested in the Civil War, WWI & WWII I am including flyers about the Ohio Civil War Collector Show in Mansfield, Ohio, May 1st and 2nd, 2010. Hopefully more members will tell me what they have found this season so I can post it in our newsletter. Also a nice picture of your find would be helpful also. Nick does a fine job of reporting finds found by Ohio detectors‘. Each copy costs around $6. As of now Nick has been sending me free copies of this magazine for each of our members. It sure would be nice if as a club member you would throw in $20 or so to cover his costs making the magazine, for a year, (four copies). I think when you see the Ohio Metal Detecting Magazine you will realize what a great magazine he puts out. Hopefully I haven’t missed anything or anyone. P.S. If someone would like to copy this letter and give it to Jim Ingeldue or Gene Wolf, I would greatly appreciate it. I usually take a copy to each of them while I’m in Lima for the breakfast, but won’t be able to do that this month. P.S. P.S. I am including pictures that Lila sent me in Feb. and some of my finds from this winter. 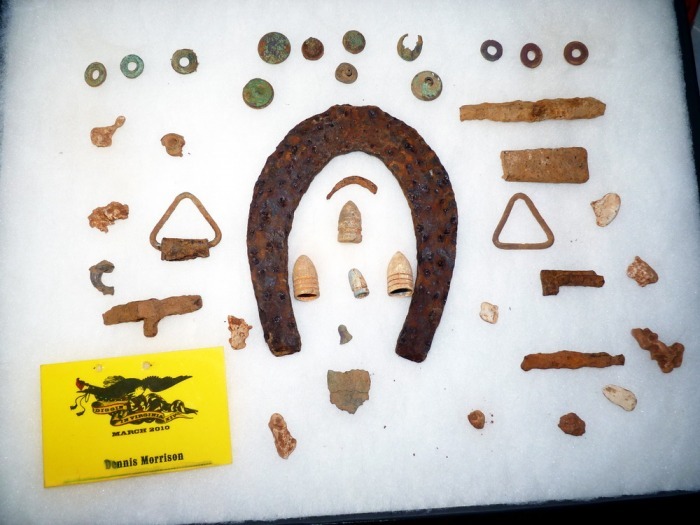 A few of the neat ones include a Flying Eagle penny, a gold ring, gold only in the inside and a picture of the Kundert Bros. Livery Stable tag and a nice picture of Gary's Half dollar in the ground. 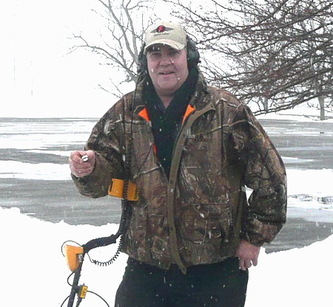 I will have copies of The Ohio Metal Detecting Magazine at our first club meeting, please try to attend. If you’re interested, members of the club meet the third Monday of the month for breakfast and a Bull S_it session at The Lickity Split on State Route 65 ,1600 North West Street near North Land, at 8:30 A.M. If you have a new e-mail address please tell me so I can send your newsletter via e-mail. As we send most of our members newsletter’s via the email, we use the stamp money for coins for our hunts. There are only 2 members of our club who don’t have an e-mail address. there is anything there yet, I'm just sending him our first club newsletter for the year. Be sure to copy the web page. 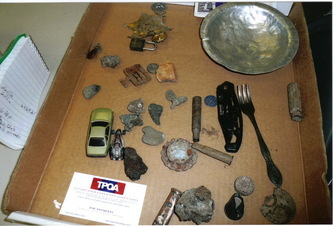 Here is a Great site for learning how to clean your finds! "Cleaning and Preservation of Coins". I got this from the Buckeye Searchers, and checked with Andy and it's open to all clubs. A way for your club to earn a little extra money. I figure people are going to buy the book anyway, so why not have the clubs get some benefit from it? For each book sold, Andy will kick back $5 to your club! I'm not endorsing the book or Andy one way or another, just wanted us all to get the money if we can. I'm attaching a screenshot of the area on Andy's website where you need to enter your club name as well. "My name is Andy Sabisch and many of you know me from the articles I’ve written being a field editor for Lost Treasure Magazine for more than 20 years along with the books and web-articles I’ve written since getting into treasure hunting more than 45 years ago. Based on the feedback I’ve received over the years, I know that the information I’ve provided has helped you find more with the time you have to spend in the field. I've collected countless books and magazines over the years and often refer back to them looking for one tip, trick or technique that might just make the difference when hunting a site that's been heavily hunted before or poses some special challenges. that can be applied to your specific form of hunting and in your area. There are appendices that provide contact information for equipment vendors, service providers and more. References to internet websites, forums and more are also included providing additional information on specific brands and specific types of hunting. Also included in the book is the 2010 Equipment Buyers Guide covering more than 125 metal detectors from all major manufacturers worldwide. Are you interested in finding out what a particular model weighs, what frequency it operates at or what controls it has? Do you want to compare several models in make an informed purchasing decision? Well, the Buyers Guide has all this information in an easy-to-read format that includes photos of each detector, information about the company, finds made by users of the equipment and accessories that can help you do better with any make or model. The book contains 256 pages and is 8.5"x11" in size . . . . . jammed full of useful information that up until now has never been assembled in one location before. This will become your first place to go when you have a question or are looking for a new or different idea to try out. It will help you make informed buying decisions on all types of equipment. With each book purchased, $5.00 will be donated to your club’s treasury! Simply visit the website below and when you order , simply enter your club’s name in the field under “Name or Inscription to Add” and as they say, the money will be in your club’s treasury! http://www.SabischBooks.com"